Photo of 3 iPhones? VPN for iPhone? 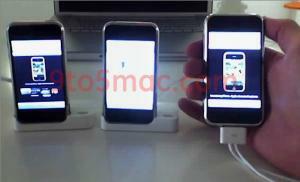 9to5mac.com posted what looks like three iPhones with docks. They flippantly say they aren't real, but have previously posted another image that appears to be a real live iPhone. The iPhones will have the standard OSX VPN client when they ship next week. This will allow connecting to Macintosh and Windows VPN Servers on L2TP or PPTP over IPSEC. The client is very simple and will be set up from its own settings pane.